Powerful eruptions at a volcano in southern Japan spewed ash thousands of metres into the air Wednesday, as authorities warned locals not to approach the mountain. 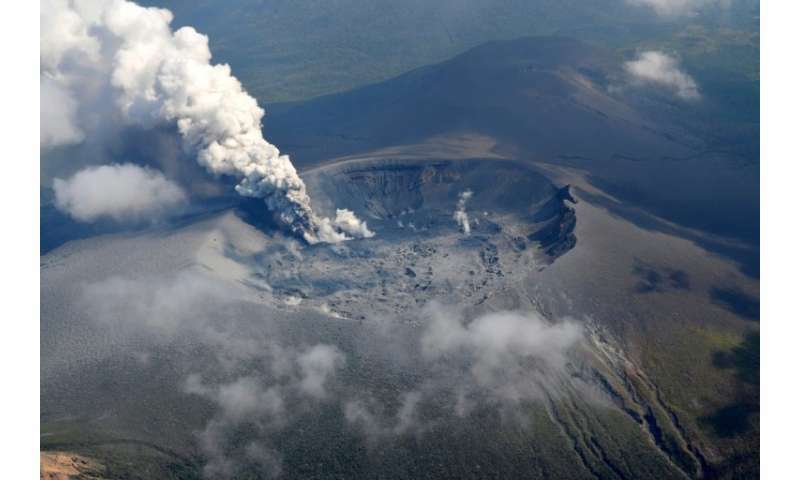 "The plume reached the height of 3,000 metres (9,800 feet) for the first time since April 3, 2011" following a total of 29 eruptions at Mount Shinmoedake, Japan's weather agency said in a statement. The volcano, which featured in the 1967 James Bond film "You Only Live Twice", has been grumbling since Thursday. But on Wednesday and the previous day, the volcano produced so-called "explosive" eruptions, which also feature air blasts. Footage captured by the Meteorological Agency showed lava and thick grey smoke rising from the mountain around midnight Wednesday. People were ordered to stay away from the volcano as major ash deposits spread from the crater, the agency said. There have been no injuries reported as a result of the volcanic activity. Japan, with scores of active volcanoes, sits on the so-called Pacific "Ring of Fire" where a large proportion of the world's earthquakes and volcanic eruptions are recorded. In January, a soldier from the country's Self-Defense Forces was killed and several other people injured after an eruption near a popular ski resort in northwest of Tokyo. An estimated 63 people were killed in the shock eruption which occurred as the peak was packed with hikers out to see the region's spectacular autumn colours.